The main vape event in Russia will be held on March 30 st- April 1 st, 2018 in Moscow. 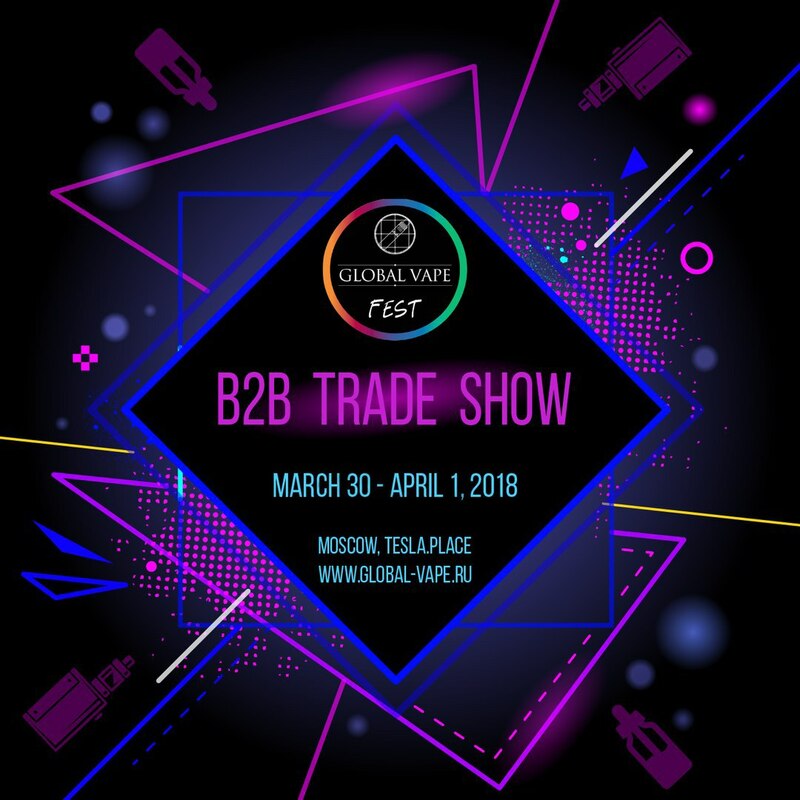 Global Vape Fest is a B2B TRADE SHOW which will gather the biggest players in e-cigarette market. The three -day event will feature over 200 exhibitors. The exhibition will be open within three days, but on the first day March 30 st, it will be held in the B2B format. This day will be dedicated to retail and wholesale sellers, distributors, looking for new products. The international vape conference will be truly global and splendid in every aspect. This is a platform to generate new knowledge on the industry from market leaders and international experts. Marketing and sales training, real business cases and current trends. Whether you are a shop owner, distributor, manufacturer, wholesaler, sales rep, marketing agency or related to the vape industry in any way, our conference will allow you to make new trade contacts and further promote your brand and services. We welcome all companies to join Global Vape Fest. The three-day event will feature over 200 exhibitors from all over the world including: multifarious range of vaping products and services, business contacts, national community, access to new potential customers, smart layout for even distribution of traffic. During the exhibition, you will enjoy enchanting show program with vape contests, the massive cloud making and exclusive dance show, interactive activities by exhibitors, including numerous traditional giveaways and the craziest contests are waiting for you. Traditionally workshops on e-Juice mixing, tricks and winding, where everyone can level up their under the guidance of our lecturers will be held. The world's first sketch festival dedicated to the vaping industry. The festival is intended to provide a platform for every talented vaper to realize their dreams. So as to promote the cross-cultural communication among vapers all over the world and make vape culture known to more people. Do you want to be the star of GLOBAL VAPE SKETCH FEST? Move now and Join! The organizer will release a special edition of the GLOBAL VAPE FEST magazine that will be circulated to all participants, visitors, media and partners. Make sure your company is listed and is a part of the magazine. Media can negotiate with their partners, socialize with colleagues and friends, get Wi-Fi connections, or just relax and have a cup of coffee in a comfortable atmosphere. GLOBAL VAPE FEST is where Business and Buyers Meet. If you consider yourself a true vaping enthusiast, you can just not miss this one.